Use Viafo’s API and libraries to talk to different APIs worldwide. Using our application management dashboard you can add and remove features, add gaming, manage social connections and gain useful insight into who is using your apps. 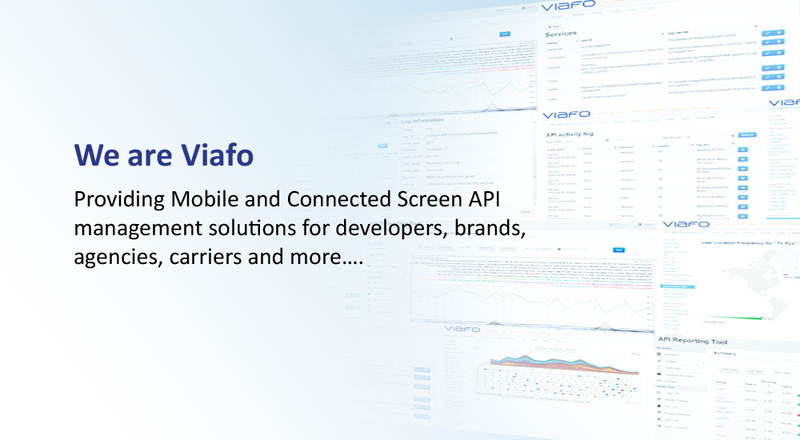 Viafo's API gateway and authentication server form the core of a powerful set of tools to allow our clients to track, monitor and understand how their developers are experiencing the performance of their APIs. Viafo provide hosted HTML5 application solutions based on our gateway to create instant, viral, hosted HTML5 applications for retail, news, media and other content delivery uses. Viafo's technology makes it affordable to have an App for every product, show and service you offer. Sign up for a free developer account today! Viafo's Services Gateway makes it simple to manage all your cross-platform apps across any screen from a single web control panel. 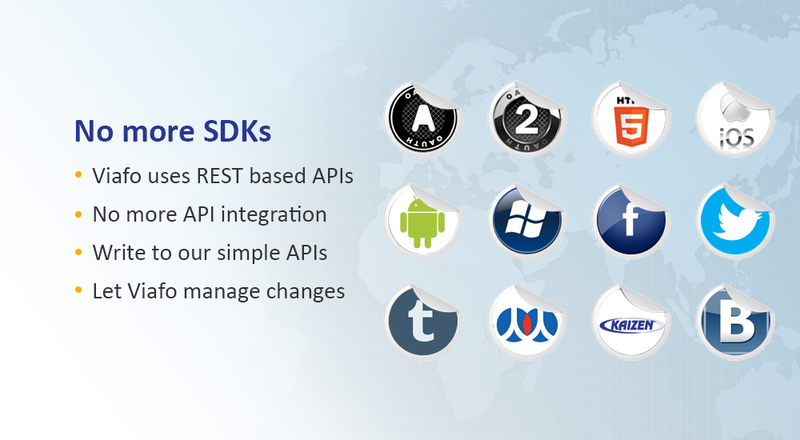 Using our SDK free approach, we give developers, brands, agencies and more a single, simple way to integrate to a variety of APIs worldwide and manage those integrations from web control panels. The gateway comes with integrated Social CRM tools and analytics. APImetrics provides you with the tools and insight to track how users and developers will experience your application by monitoring your or 3rd Party APIs in your technology. In addition to giving you a rolling record of uptime on different APIs, our service tracks average latency for using them, giving you real world, end-to-end data on the likely user experience. As demands for apps increases, keeping up with that demand and being able to respond quickly, without the limits of App Store approvals or different screens getting in the way. 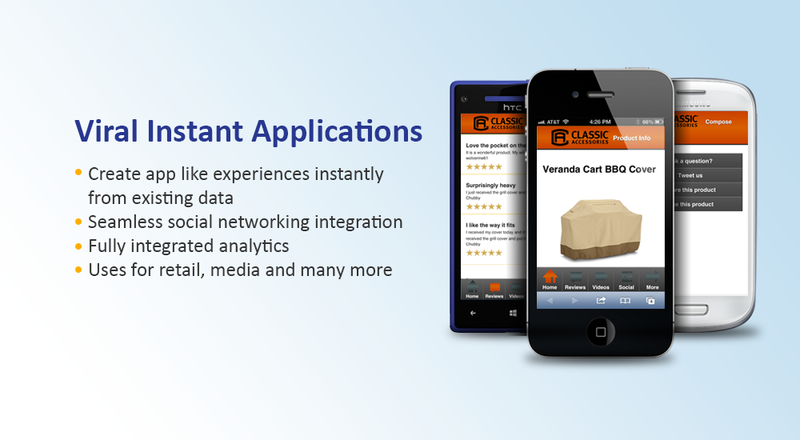 Viafo's hosted Instant App Solutions are designed to allow media companies, brands, retailers and others create and distribute mobile content quickly and effectively. With fully integrated analytics and social networking, you can take control of your content strategy. People love to share, social networking sharing of news and information is now ahead of games as what people spend their time doing. Viafo's Gateway enables a range of sharing with social networks around the world. Beyond sharing, Viafo provides a simple way to add the full range of Social Networking functions to your application or service. Don't just show a Twitter feed for your movie, TV or news app - let people Follow, Reply and Repeat what people are saying. Check out TVPyx from Pyxis Ventures for an example of what we mean. Breaking the wall between the online and real worlds needs interactive applications and a strategy for getting in touch with consumers and users. Viafo's Gateway enables coding free connections to services like BazaarVoice. Work with QR codes or NFC technology to provide reviews, social buzz and other information direct to the user. Our Cloud Based hosting can even provide HTML5 access to information for users. Adding carrier and operator APIs to applications can be a challenge, lots of standards documents, difficult to manage portals and expensive services to navigate. Starting with AT&T, Viafo is adding carrier APIs to our gateway to enable services like messaging, location and payment, through standard APIs and with simple to use code examples and debug tools. Rather than managing payment scenarios in your app, manage your payment scenarios from the cloud. Viafo have a number of solutions targeted at helping the creation of interactive, viral, HTML5 based advertising. Using our platform as the core, we can enable rapid deployment of advertising and tracking of how people are using and sharing information, including identification of your key users and sharers.